In MoshTemp202 we are merely loading the v2Anomaly object that we created in MT201 and wrote to file. For the folks who have read through GISSTEMP I am taking a similar approach to documenting every datastep with an output file. This allows me to test every step and also share data at every step. V2Anomaly is the step after we have Windowed the data, and combined duplicates. See the comments section where I explain JR’s confusion over what a duplicate is. Its tricky so be careful. Anyway, after we combine duplicates ( I do it different that Hansen) we then create an Anomaly. So V2Anomaly is a datastructure that has COLUMNS of Stations ( each colume NAME is a GHCNID) and each row is a month. Each row name is a time. 1900, 1900.083, etc. And the data in the matrix is temps in 1/10 C. No need to change that right now. So, in MT201 we saw how we can get a station count just by turning temperatures to T/F flags and summing. When you work in R you have to relearn some old tricks, like masking. Anyway, In todays chart and example I do the following: I take every ROW (month) and I take the mean of all temps in that row. This is actually our FIRST estimate of the global average. See how? Its the average where ALL stations get the same weight. Its an important result. we have 5000 or so stations and we just average them all without regard to their spatial location. Whats your best ESTIMATE of the average temperature for california? 60F. Now, is it 60F everywhere? Nope, that not what the estimate MEANS. The estimate means this. Given the information you have your best estimate for unknown location X,Y in california is……60F. No guess will be better on average. Now, I add some information. I tell you that it is 60F in Oakland, The chart above shows the following estimate. (50+60+70)=180. divide by 3 = 60F. That’s an estimate that takes no notice of the spatial information. Oakland is nearby SF. Our next step therefore is to apply our spatial information. We do that by gridding the stations onto the world. My gridding differs from Hansen’s gridding. He uses equal area squares. I use lat/lon grids and then adjust for the area in the grid. More on that later. The next step will involve bringing in the station inventories and “gridding” the inventory. So a peek ahead. Please fetch Moshtemp2.zip at the drop. In your pool analogy, it would be depth that matters most, and I assume that’s the point of singing ‘Down in the Valley,’ right? Nice paper, btw. Well the point of the pool analogy is just to illustrate the concept of spatial sampling. exit of my alimentary canal? it’s an interesting graph, but what is it representing? 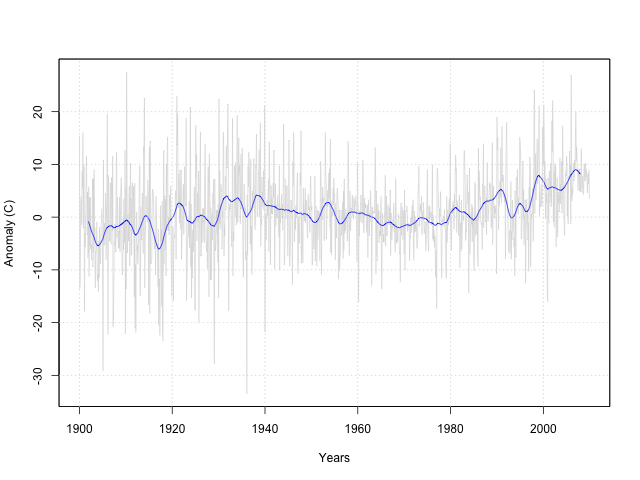 A ~10C increase over the C20th seems a bit drastic, is it supposed to be ~1C?. Where did the 1940 spike go? Read the text. The measurements are all in 1/10 C, like the source. When we get to the very end I will scale it properly. The choice has to be made to either scale at the front end of the stream or at the end. Currently I will multiply divide doh. by 10 at the end. 1940 spike? Recall you have a UNWEIGHTED average here so you cant compare directly to GISS or CRU.. YET. OK. Thanks for all the hard work you’ve done on this.